This first posted at Vault of Evil. When this anthology came out, Gabe Chinoird's cover design attracted some criticism as not representing the contents of a horror anthology. Still true; though looking at it now, I think it was probably an interesting attempt at suggesting the way more 'modern' ruins have supplanted the crumbling gothic castles of yesterday, so it's at least an interesting way of suggesting the urban horrors dealt with herein. School of Fought by Gary Fry: “They say he eats kids’ brains,” says the taxi driver on the way to the school. Jake Powers is the new English teacher joining the small Yorkshire school. He wants to inspire his students with a love of literature, but Mr Cannon the Headmaster seems determined to smother any joy of learning in his students. Jake learns that one of the boys, Matthew Carnal, has actually died as a result of the Head’s repressive ways. As evidence of the dead boy’s disturbed state of mind, Cannon shows Jake something that he’d made in handicraft class, a strangely designed piece of cloth. “It’s a straight jacket,” the Head explains, “for the head.” Before his death, Matthew Carnal had been quite literally losing his mind. This story with its small school set beside a graveyard could almost have been lifted directly from one of August Derleth’s anthologies. Hoody by David A Riley: Lawrence Huxtable is on his way home for a comfortable night in with a couple of DVDs and a six-pack of Fosters when he glimpses the hooded figure standing across the car park. Much later that night he sees the figure from his window, standing in a nearby shop doorway. The same man? ‘Hoodies’ are by definition anonymous figures, as a politician recently pointed out. That night someone is killed in the street, stabbed close by the shop doorway where the hoody had been waiting. Lawrence visits the police and finds that a serial killer has been on the loose, one who collects gruesome trophies from his victims. But the only suspect that the police had is dead. 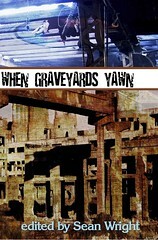 Of the six stories I’ve read so far, this one probably best defines real ‘urban horror’ as described on the back cover. Hollow Heart by James Cooper: by James Cooper: Hillard seeks out the lonely farmhouse where Gretski lives on a night of driving rain. He knows that Greski has used the land – his old apple orchard – to give him back his son. And now Hillard wants his dead wife back the same way. Prefaced by excerpts from both Pet Semetary and The Monkey’s Paw this story works elements from both to good effect. Poe Pourri by Gary McMahon: Simon Carter sells bizarre ‘Arcana’ to collectors. “Dickens Quill, H P Lovecraft’s finger joint, or Stephen King’s freeze-dried faeces.” The money is good, and it lets him provide for Ellen, his latest fashion-model girlfriend. Simon’s latest find is the skull of Edgar Allan Poe, “just like in that corny old movie.” The skull is stuffed with small dried leaves; it seems to keep moving about, and there’s a smell of sweet perfume in the air. Actually I thought that the skull in the movie was that of the Marquis de Sade; but that small point aside, this is an enjoyable poem to Poe. Spectre at the Feast by Jeff Gardiner: Charlotte just wants them all to sit down for a family meal around the table. It’s not a lot to ask; she doesn’t want anything grand. She just feels that her role is to hold the family together. And everyone knows the bonding quality of a family meal. But husband Nathan has to work late, daughter Heather always visits a friend, and son Jake spends less and less time at home. And Charlotte seems to be haunted by a grim figure in the house. You will not anticipate the chilling twists that this story takes. The Road to Hell by Gary Power: Anthony Lerrom, disgraced MP, breaks speed limits and almost every one of the Highway Codes speeding up the M25 to a radio interview. Lerrom is a selfish and thoroughly dislikeable character, and he likes pushing his new BMW to its limit. He terrifies other drivers, cutting across lanes and between juggernauts, and it looks as if he’ll get away with it. But he ends up causing the biggest motorway pile up in driving history. Investigate the carnage, he meets Shadrac Wilmsey, who warns him that he’s upset a lot of people, and they’ll want their revenge. The Soul Hunter by Michelle Ponto: Jarrod Moore steals a sophisticated piece of software and sells it to a foreign power. He also betrays his lover, the beautiful and brilliant CIA programmer Shel, leaving her for dead in the hands of her enemies. As he abandons her she warns him that she’ll have her revenge. Soon after that, he first sees the dark woman in the shadows, watching him. And soon the people close to Jarrod start to die. The Confessions of Imray by Geoffrey Maloney: Opening with a quote from Rudyard Kipling’s The Phantom Rickshaw which reminds us of the dangers of overwork, this one goes on to tell us of Jack Imray, who works too hard, but also tries to speed up his promotion by bedding his slightly older lady boss. The affair goes wrong – her husband learns about it – and we find Jack Imray in a private room at St Dympna’s, a private hospital in Brisbane, following the her death. Imray asks his friend to read him the number plate of the metallic green BMW in the hospital car park. He is sure there can only be one car like that in Brisbane. But the last time that he saw it was wrapped around a steel crash barrier. Geoffrey Maloney has a distinctive story-telling style, and the narrator of this story, who is practised in occult dealings, strikes me as a character suitable for a series. Kagan Bang by David Murdoch: Jarvis brown is the lead singer of Kagan Bang, the biggest pop group of the Eighties, but when Andrew Mackwell asks to kill him on live TV, Jarvis agrees with alacrity. His song writing partner seems to be getting the better press, and it’s true that people seem to be spoken of more favourably after their deaths. Andrew Mackwell has engineered a number of publicity scams, and now he has given Jarvis a chance to have his cake and eat it, too. After he’s dead, that’s when the fun will begin. Or that’s what Jarvis believes. La Ronde by Peter Tennant: Melanie is soaking in the bath, enjoying her Friday afternoon, when she hears someone enter the house. It’s only her brother Rob, though, so she decides there’s no need for concern when he enters the bathroom. But suddenly he attacks her. The previous evening, Melanie and five of her friends had experimented with an ouija board found in the attic. Whoever or whatever had controlled the planchette had known more about the people at the séance than was comfortable. And it tells them all quite clearly how each one will die. This one has quite a complex narrative, which at first looks as if it won’t make sense – but in the end, it does. Zulu's War by David A Sutton: The greatest horror of all is war, and Zulu and his mates are just back from a tour in Iraq. Despite the beer, the evening isn’t an easy one; he has memories of ‘his own little mass murder’ in a small village. On his way home, he takes a detour through a small cemetery in the dunes, and finds that something has followed him home from the war. He has taken two things from the scene of the murder in the village. But he can no longer give one of them back. Journey's End by Sean Wright: Journey’s End by Sean Wright: The unhappy couple on the platform of the underground station seem condemned to eternally relive the moment of their deaths under the wheels of the train. But the man wants to know why she, his truest love, caused their demise. As this story unwinds she gets increasingly vindictive and he angrier, and the backdrop of the story takes on a hallucinatory quality as they board a train peopled by insectiants, dwarfs and sheep-women. Sean Wright clearly isn’t too concerned with realism or ‘linear narrative’ here; he seems more interested in exploring his own inner landscape. There don’t seem to be any easy answers as to what this one’s about, or if there are, it’ll take someone else to explain them to me. The relationship of the lovers is interesting, and probably as ‘realistic’ as any relationship can be. The journey that’s described might have been from a forgotten notebook kept by either Lutwidge Dodson or William Burroughs. These stories really deserve more space than I’ve given them, and they provide interesting contrasts in colour and mood, from David Riley’s grim urban nightmare of the deadly figure under the streetlamp to the softer colours of Gary McMahon’s haunted lovers and Lisa DuMond’s sepia-tinted journey through Whitby. Gary Fry’s story feels like a time-trip back to the Sixties, while there’s experimental narrative from John Llewellyn Probert, Peter Tennant and Sean Wright. David Sutton’s story is the one that stuck in my mind, with its contrasting news headline shocks and moody pulp ending. My favourite story, based on that rarest of things, the quite genuine chills that it provoked – and I felt more than one, while I read it – would be Jeff Gardiner’s The Spectre at the Feast. I’m starting to run out of things to say about the stories, although there are more here that deserve further mention, so I’ll just finish by saying that this is an excellent anthology, and one that’s well worth adding to your library. These days Sean Wright has returned to making music, and in particular with his Album a Month project. Our loss, I think, and music's gain. 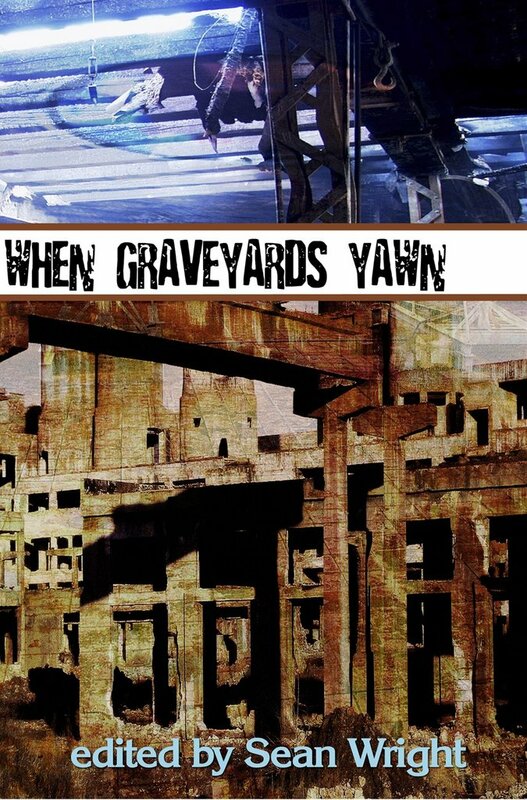 Looking back on When Graveyard's Yawn after a few years, it still seems a fine anthology.